Voice types are easier to figure out if you know where to find the notes on a musical staff. The names of the notes are A, B, C, D, E, F, and G. Those notes repeat across the piano. 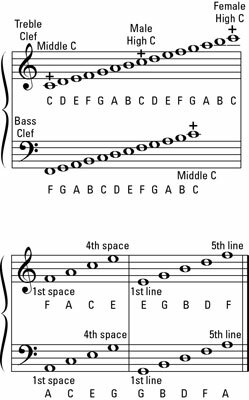 The treble clef spaces correspond to the notes F, A, C, and E. Beginning on the bottom of the staff and going up, the notes spell face. You can use sentences to remember the other notes. Again, starting on the bottom line and moving up, the notes on the lines of the staff are E, G, B, D, and F, letters that begin the words of the sentence Every good boy does fine. For the bass clef, the spaces are A, C, E, and G, the letters that begin the sentences All cows eat grass or All cars eat gas. The lines in the bass clef are G, B, D, F, and A, which correspond to Good boys do fine always. If you prefer animals, then use Great big dogs fight animals. Locating notes on the staff. If a singer’s range is Middle C to High C, you have to use ledger lines to notate those two notes because they’re not within the five-line staff. Ledger lines are extra lines added above or below the staff for notes that are higher or lower than the notes on the staff. When you find Middle C in the above illustration, you can see the extra line added below the staff. The easiest way to find Middle C on the piano is to look at the brand name printed on the lid covering the keys. If you find that brand name, the C right in the middle of that name, or just to the left, is usually Middle C.
Middle C is called Middle C because it’s in the middle of the keyboard that contains 88 keys. Middle C is also called C4, because it’s the fourth C on the keyboard. If Middle C is C4, then the next C above is C5, and so on. C is the note just to the left of the pair of black keys. The distance between the two Cs is called an octave. If you start counting at the first C and count eight white notes up, you find another C. That means the E just above Middle C (C4) is E4. Easy enough, but not every person you encounter knows this system, so stick to what works: Middle C.
You also encounter the words flat and sharp. Flats lower a pitch a half step and a sharp raises the pitch a half step. F-sharp is the black key on the piano between F and G. The same black key between F and G can be called G-flat.